A tasteful and private contemporary tropical home, within a short stroll of Choeng Mon beach. Service daily maid and manager on call. Amenities satellite TV, DVD/CD, WiFi broadband internet, air-con throughout, fully equipped kitchen, BBQ. 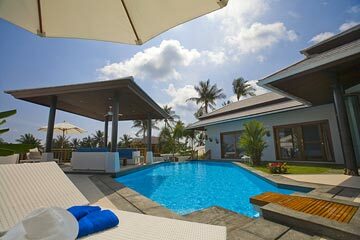 Samui Blu is a tastefully completed and comfortable 3 bedroom holiday home, built around a 15sqm sky-blue pool. The villa is conveniently located within walking distance of Choeng Mon beach, and within easy reach of the island’s main attractions. Shops, restaurants, spas, and bars a short stroll away. Samui Blu is designed on a single raised level, with high walls and a security system to ensure total privacy. All rooms have both air-conditioning and ceiling fans, and open onto the pool and garden, with bedrooms on either side connecting to the central living area. The open-plan living room includes a comfortable lounge with a large sofa facing the wall-mounted 45” LCD screen, with cable TV, DVD, and sound system with iPod dock. A library of CD's and books is provided, and complimentary WiFi internet via USB dongle is available on request. The dining table seats 6 in comfort, and is served by a fully-equipped kitchen with marble counters, fridge/freezer, Smeg dish washing machine, 5 burner hob/cooker, rice cooker, and espresso machine. A floor-to-ceiling glass window overlooks shady tropical gardens to the rear. In the utility room, off the living room, an automatic washing machine is provided together with iron, ironing board, and drying racks. A safe is provided for valuables, and there is also a guest bathroom off the living room. Foldaway glass doors open onto the patio and pool area where there is an additional al-fresco dining set and a large gas BBQ, along with sun-loungers and parasols. Adjacent to the pool is a large sala pavilion with ceiling fan, and sofas arranged around a coffee table. The master bedroom features a King-size four-poster bed, and an exotic indoor/outdoor bathroom with twin vanity basins and a corner bath tub. The 2 additional en-suite bedrooms in the opposite wing both have Queen-size double beds and en-suite bathrooms. One of the Queen bedrooms includes an LCD TV and DVD player. All of the en-suite bathrooms are spacious, and have granite counters, walk-in rain-showers with additional hand-held showers, and feature large windows overlooking the garden. An ideal hideaway home for friends and families alike, Samui Blu is located in a quiet and peaceful residential area, within easy reach of the beach and the island's many attractions. Samui Blu is conveniently located within a minute’s drive of the idyllic Choeng Mon beach, with the tourist Mecca of Chaweng, and the charming Bophut Fisherman’s Village both within 10 minutes drive. Koh Samui airport is 10 minutes drive away. -Rates are inclusive of surcharges, airport transfers, and daily maid service. -Minimum stay of 4 nights in standard season, and 7 nights during peak season. *Check-in time is 14:00 and check-out time is 11:00, although early arrival and late departure may be requested subject to availability.